Posted at 10:42 am by Yummytums! It’s just wrong to waste pumpkin. Then again, I could probably eat it straight out of the can and be happy. But this is a much better way to enjoy it. So if you have some left-over pumpkin, try this recipe! The muffins come out moist and yummy and it calls for whole wheat flour, which is a plus in my book. I found the recipe on a favorite site (Allrecipes.com) and decided to give it a try. The original version calls for golden raisins, but I prefer dried cranberries and I think they’re a great alternative. Next time, I might also add some cinnamon. 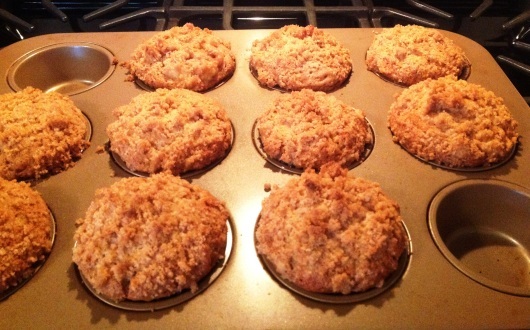 I used an organic unsweetened applesauce and the muffins aren’t overly sweet; they came out just right. My husband also really liked them and he’s not nearly as enamored of pumpkin as I am. Preheat your oven to 400 degrees F (200 degrees C). Grease 12 muffin cups, or line the cups with paper muffin liners. For the fall-obsessed like me, this is a great time to use those pretty muffin liners with the colorful leaves all over them! Whisk together the flour, baking powder, baking soda, salt, and pumpkin pie spice; set aside. 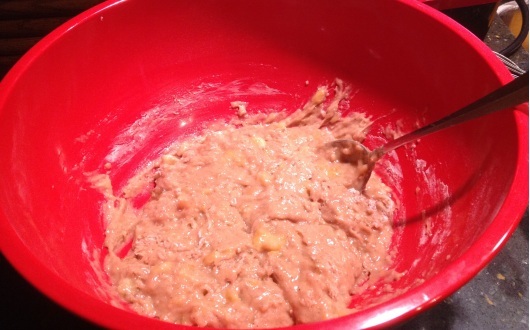 Combine the brown sugar, white sugar, oil, applesauce, pumpkin, buttermilk, and beaten eggs and mix until well blended. Pour the pumpkin mixture into the dry ingredients and stir until combined. Fold in the dried cranberries and pecans, if desired. 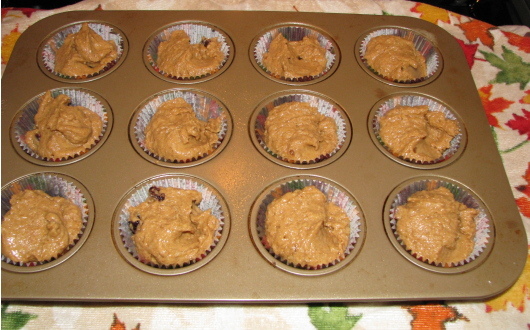 Divide the batter evenly in the prepared muffin pan. Bake in the preheated oven until the tops spring back when lightly pressed, 15 to 20 minutes, or until a toothpick inserted in the center comes out clean. Mine ended up taking 18 minutes. Cool the muffin pan on a wire rack for 5 minutes before removing the muffins from the pan.